BRISTOL - In the bottom of the second inning against Bristol Eastern on Tuesday, Southington pitcher Julia Theriault was already beginning to warm up outside her team’s dugout. 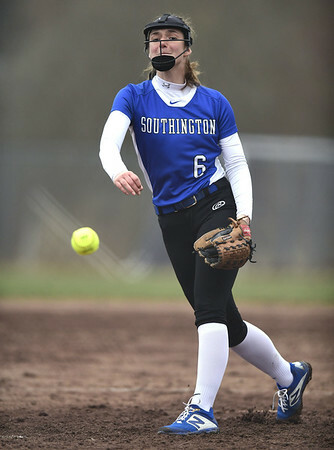 Even though Blue Knights sophomore starter Julia Panarella was doing just fine under the cold, rainy conditions, Southington softball head coach Davina Hernandez still wanted Theriault getting loose. After Panarella capped off a 1-2-3 inning by inducing a pop up, Theriault was inserted into the pitcher’s circle in the bottom of the third. For the Blue Knights, who lost 3-2 in a five-inning, rain-shortened game, it looks like that is going to be the pitching strategy throughout the 2019 season. Southington (2-1) plans on using a handful of arms in a by-committee approach, as Panarella, Theriault, Katelyn Lipsky, Kelsey Fernandez and Dominique Gaudio will see the bulk of the innings. This comes a season after 2018 All-State and three-time All-CCC selection Kara Zazzaro, now a freshman pitcher at Iona, threw more than 80 percent of the Blue Knights’ innings last spring. On Tuesday, Panarella allowed two earned runs on two hits with three strikeouts and one walk in her two innings of work, throwing 23 of her 32 pitches for strikes. Theriault, meanwhile, allowed one run on two hits with a strikeout and a walk in three innings. So far, Hernandez has been pleased with those performances, especially considering the circumstances. Posted in New Britain Herald, Southington on Wednesday, 10 April 2019 21:09. Updated: Wednesday, 10 April 2019 21:12.